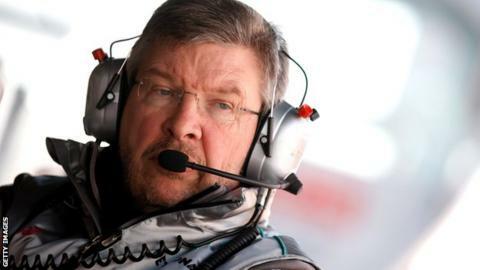 Mercedes want to replace team principal Ross Brawn as part of a restructure aimed at improving the team's performance. The proposal is to replace the Briton, who masterminded Michael Schumacher's seven world titles at Benetton and Ferrari, with two new appointments. New executive director Toto Wolff is the first of these and he has already agreed a deal to bring in McLaren technical director Paddy Lowe. "There is a huge irony for McLaren in Mercedes' desire to poach their technical director Paddy Lowe. "The Brawn team were only able to come into existence after the personal intervention of McLaren team principal Martin Whitmarsh with the Mercedes board. "Four years later, the team has been taken over by Mercedes, and the German company has dropped McLaren as its works team. "For the first time this season, McLaren have to pay for their Mercedes engines and now they could lose their technical director to their former partner as well. "McLaren faced a similar situation in 2001, when their then technical director Adrian Newey - now the chief technical officer of world champions Red Bull - struck a deal to join Jaguar. "Newey was later persuaded to change his mind by then-McLaren team principal Ron Dennis, now the chairman of the McLaren Group. "But his dissatisfaction at McLaren eventually led him to leave and join Red Bull, which had taken over Jaguar, in 2006." Their intended job titles are not clear but Wolff, 41, will likely be team boss and figurehead with Lowe, 50, running the sporting and technical aspects. McLaren have refused to comment on the situation. On Tuesday afternoon, Wolff said in response that he "hoped Ross was going to stay" but would not be drawn on whether Brawn would be replaced as team principal. "I admire what Ross has done but I need to understand the structure and what Ross has done," he said. "At this stage, it would be foolish to come in and speak about replacing anybody." On Lowe, Wolff said: "I think he is a recognised person in the paddock who has been with McLaren for 15 to 20 years. In Formula 1, there's always a lot of speculation about people." The planned restructure would leave no obvious place for Brawn or chief executive officer Nick Fry, the two men who, in the winter of 2008/9, saved what has become Mercedes following the withdrawal from Formula 1 of then owners Honda. The Brawn F1 team won the 2009 drivers' title with Jenson Button as well as that year's constructors' title before being taken over by Mercedes ahead of the 2010 season. BBC Sport understands Lowe has agreed to join Mercedes but has not yet signed a contract. There is a possibility, however small, that he will stay at McLaren. However, it seems Lowe is keen to move on from his role as technical director as he had previously accepted a position as team principal at Williams, which was offered to him by Wolff, before the Mercedes offer came up. Although Wolff is now committed to taking Lowe with him to Mercedes, BBC Sport understands the German company's initial contact with Lowe pre-dated Wolff's involvement. BBC F1 chief analyst Eddie Jordan, who has broken two major Mercedes stories in the last three years - with their signings of Schumacher in 2010 and Lewis Hamilton for 2013 - has also discovered the team's plans. "Paddy Lowe is going to Mercedes and it would appear that Brawn and Fry are on their way out," Jordan said. "Lowe won't be technical director - he'll be more senior than that - but he won't be called team principal either, because that will be Wolff. But Lowe will effectively be running the team on a day-to-day basis." It remains to be seen how Mercedes will resolve a potentially sticky situation. The plans of Wolff and Mercedes F1 non-executive director Niki Lauda are to keep Brawn in place until Lowe's 'gardening leave' from McLaren is completed. This period is usually six months off work for senior personnel moving employers. But if Brawn knows he is to be replaced, it seems unlikely he would want to stay on just to keep things going for Lowe. The decision of Mercedes to remodel the top of the team has been based on the perceived need for change after performing below expectations for the last three years. Mercedes effectively brought Brawn into existence in early 2009 by agreeing to provide them with engines following Honda's withdrawal. But staff cuts made because of a lack of budget during 2009 contributed to a dip in form when the team morphed into Mercedes in 2010, when Schumacher joined after coming out of retirement. The German legend expected to be able to challenge for an eighth world championship. Instead, Mercedes have won just one race in three years. Schumacher's best result was an inherited third place at Valencia last year. He also set pole position in Monaco in 2012 but was demoted by a grid penalty. Although 2012 started promisingly, with good qualifying form in several early races and a win by Schumacher's team-mate Nico Rosberg at the third race of the season in China, the team's form dipped alarmingly and by the end of the season they were struggling to score points. Brawn has insisted that they had been hit by a technical reshuffle that impacted on their attempts to develop last year's car and has said that he believes the right structure for success is now in place at Mercedes.